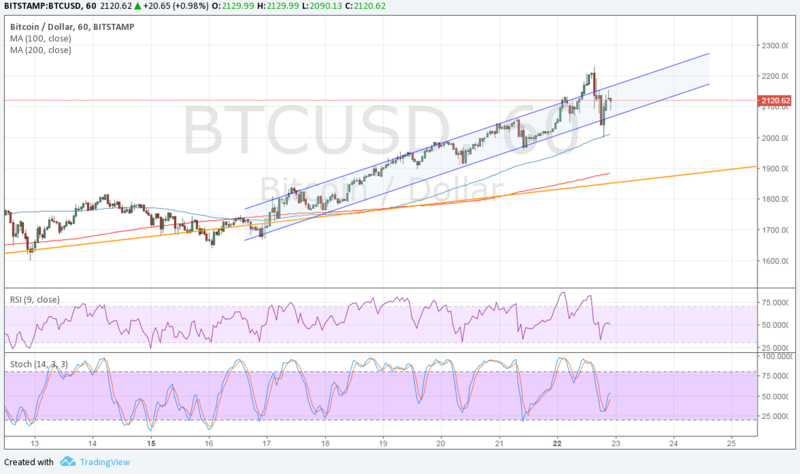 Bitcoin Price Analysis for 05/23/2017 – What’s Up with Nonstop Climb? Bitcoin price has established new all-time highs once more as volatility picked up. Price spiked back and forth but is still inside the ascending channel visible on its 1-hour chart. Price is bouncing off the support again and could be due for another test of resistance. Bitcoin price looks ready for more gains as it made new record highs and bounced after a quick pullback. The 100 SMA is above the longer-term 200 SMA on the 1-hour chart so the path of least resistance is still to the upside. The gap between the moving averages keeps getting wider to reflect strengthening bullish momentum. Also, the 100 SMA just recently held as dynamic support on the pullback. Still, the odds of profit-taking keep growing as bitcoin price establishes new record highs, with a major correction likely to happen at some point. If so, the cryptocurrency could find nearby support areas at at the 200 SMA or rising trend line for May, which are currently around $1900. Stochastic is turning up without even reaching the oversold area, indicating that buyers are eager to push bitcoin price higher. Similarly RSI is heading back north so bitcoin might follow suit. Another test of the $2200 could be underway or perhaps a breakout. Persistent geopolitical risks are seen to be the main factors supporting bitcoin price at the moment, with the latest being the reported blast in Manchester Arena that is being ruled as a terrorist attack. This brings uncertainty ahead of the Brexit talks and UK snap elections next month. Meanwhile, demand for the dollar continues to slide due to the ongoing investigation on Trump’s intelligence information leak to Russia. Any indication of a security breach could keep impeachment speculations in play, along with foreseen delays in fiscal reform. Greek debt concerns are also back in the spotlight as the Eurogroup meeting concluded without any agreement on the next batch of bailout funds or on debt relief. Recall that the lack of funds to pay for debt obligations led to capital controls in the country a few years back, which yielded a lot of gains for bitcoin price as well.